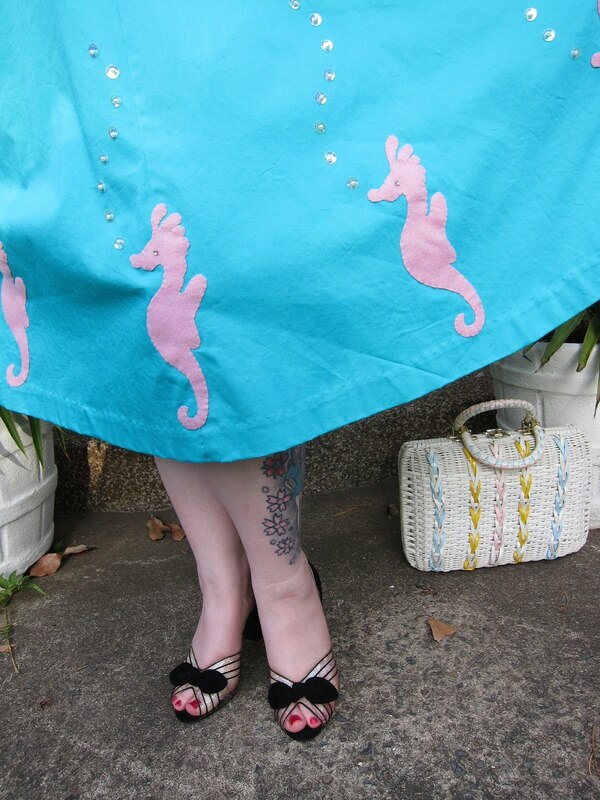 If you’re on Instagram, you might have seen me alluding to a seahorse dress I was making – well, it’s finally finished! 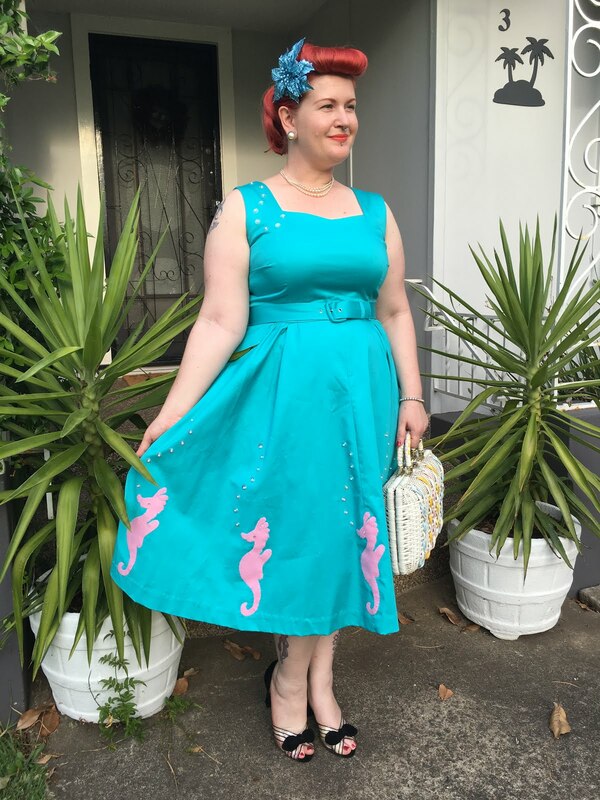 I was going to an end of year Christmas Party with a sea-theme and realised I had nothing to wear. Great reason to make something! 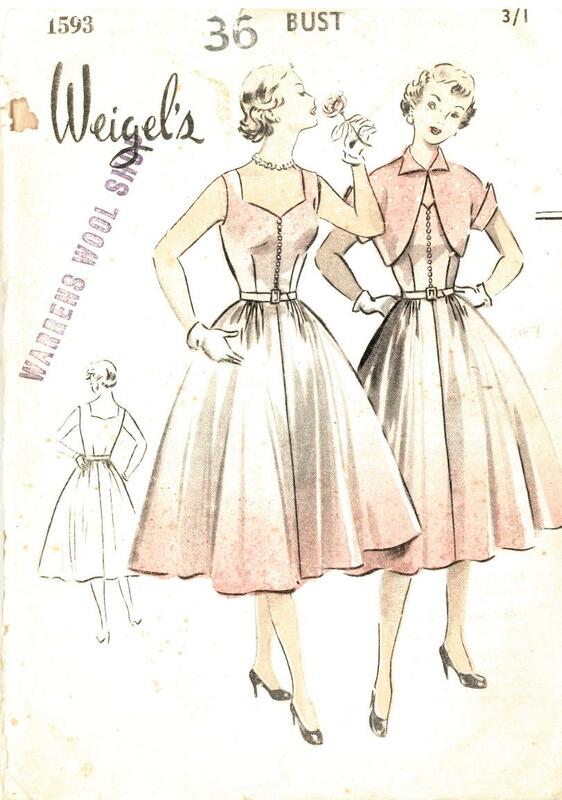 The pattern is Weigel’s 1593 – an Australian pattern, I’m thinking early-mid 1950s? 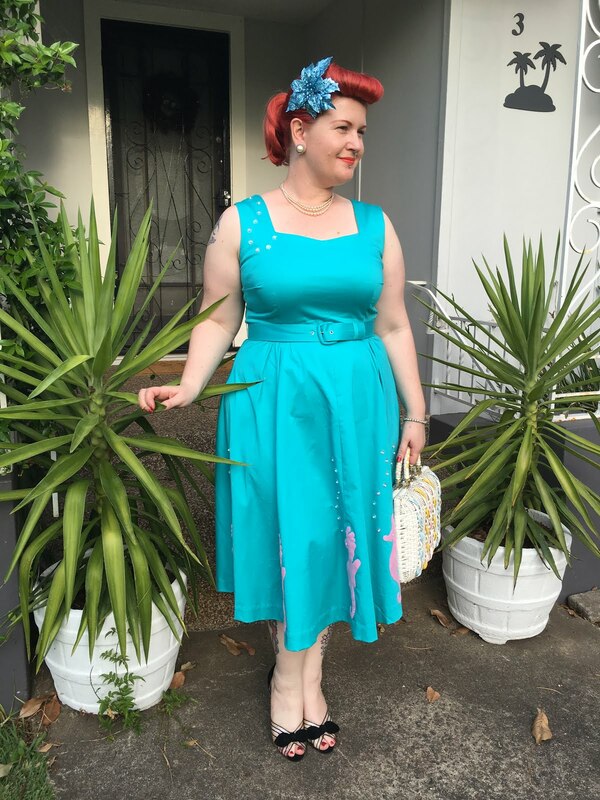 The dress is made in stretch cotton sateen – not my favourite fabric, but I needed something with body to make the skirt sit properly. 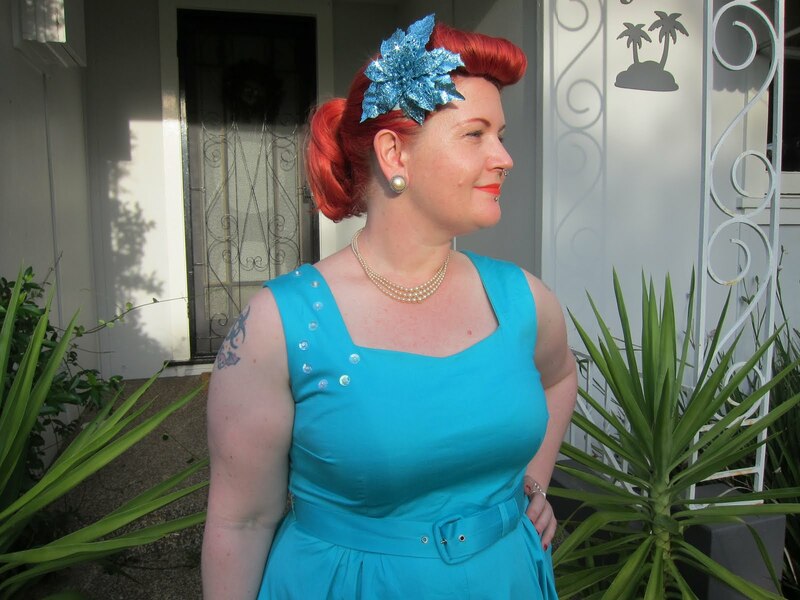 I didn’t want to wear a petticoat as we’d be dancing and it’s very hot with more layers. The skirt is more of a 3/4 circle than a full circle – it even has cute little gathers for some interest. lengthen the straps by about 1/3 of a inch. Hairflower – made by me, Xmas flower from SpotlightBut the main amount of time was on those darn seahorses – they took forever! I used the seahorse template from a free knitting pattern I posted last month – the Novelty Seahorse Jacket. They’re cut from felt, and hand-stitched around the hem (ten in all). They have diamantes for eyes, and the bubbles are large sequins with pearls in the centre. I repeated the bubbles on the bust for symmetry. To get the bubble lines the same every time, I used a template to repeat the shape for each seahorse. The dress itself was very easy, so perhaps. 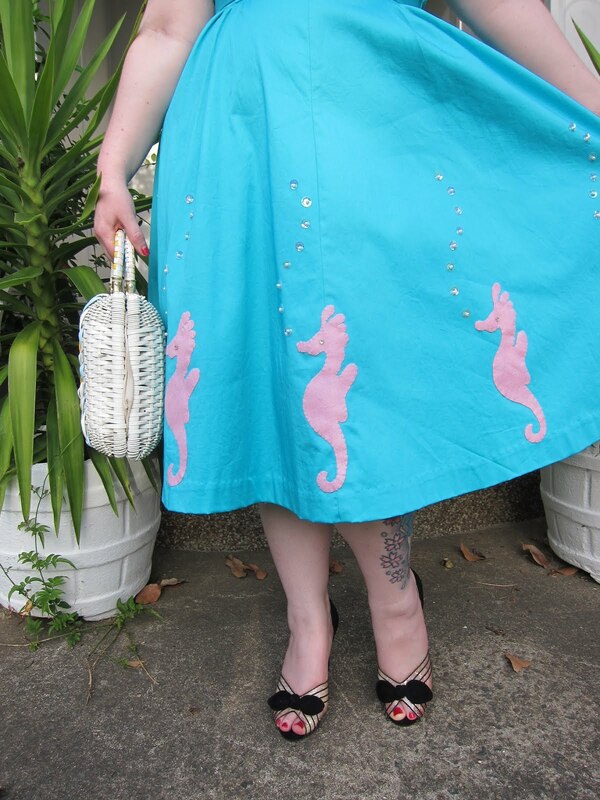 I do have plans for a similar skirt involving lobsters. LOBSTERS. But I need to recover from this dress first. 1960’s wicker bag – found at a market. Beautiful! Love love love the seahorses. Have a good party! I am in love with your creative use of the seahorse template! The color and fit of the dress are marvelous! This is officially, off-the-charts spectacular! 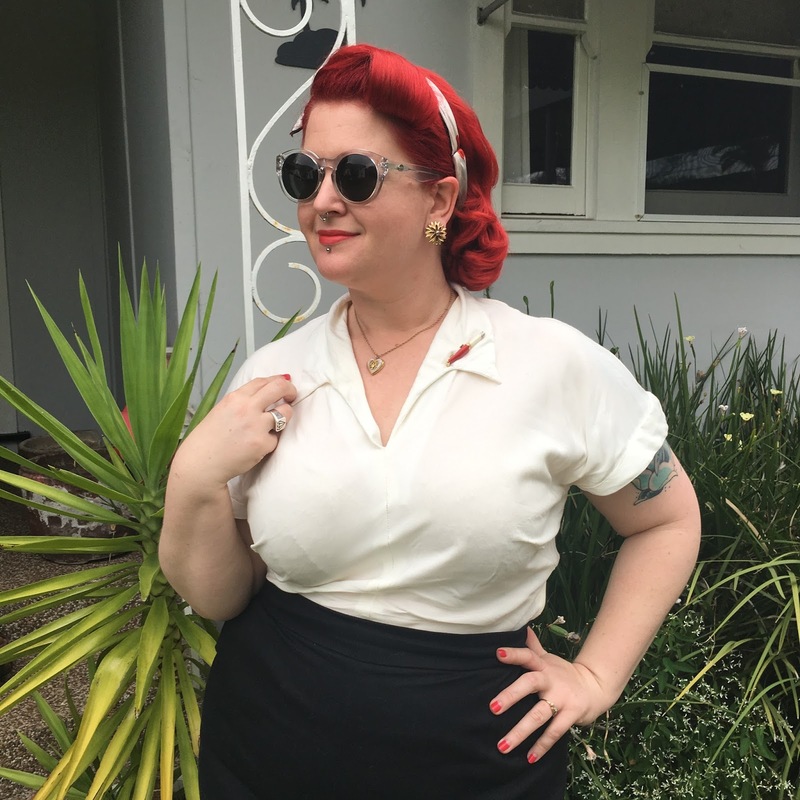 What a stylish, adorable creation that looks positively stunning on you, sweet lady.